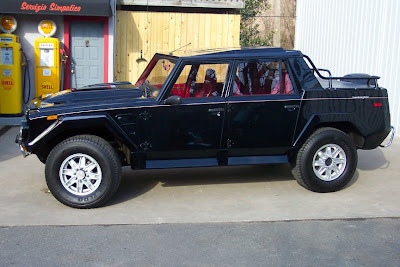 One of our customers just purchased a Lamborghini LM002. It’s in pretty good shape and we’re just doing a little maintenance and fix-up on it. 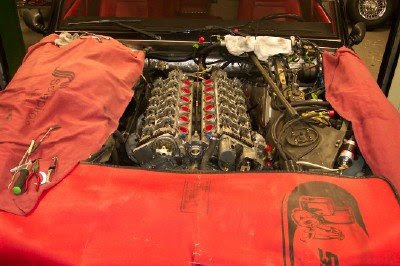 This LM is a 1991 so it has what is basically a Diablo V12 engine with electronic fuel injection. While performing a compression test, I noticed oil had leaked into the spark plug wells so it was decided we should replace the cam cover gaskets and while the covers are off we might as well check valve clearances and cam timing. None of the valve clearances were really way, way out of spec but 20 out of 24 needed to be adjusted by replacing the shim wafers that sit on top of the tappets. The cam timing marks were off too. If the engine was out of the vehicle we would have set the cam timing with a degree wheel and dial indicators but since the engine stayed put we just lined up the marks on the cams and bearing caps. Who ever had the cam covers off the last time used way too much sealant so we had quite a bit of cleaning up to do. The expression ‘If a little is good a lot must be better’ does not always apply. Three out of eight of the threaded M6 holes in the fronts of the cam cam covers were stripped so we drilled and rethreaded them oversize for M6 Heli-coil inserts. The bolts and studs will have nice healthy thread to grab onto now. The mechanic at the factory who assembled this engine apparently wasn’t paying attention when he bolted the chain guides into the cam covers. The chain guide holes in the left cam cover were not correctly spot faced so that the seal washers had nothing but a rough cast surface to mate against causing an oil leak. We spot faced the holes correctly and the leak shouldn’t reappear. The tubular aluminum “bolts” that secure the cam covers to the cylinder heads and double as spark plug well liners should always be installed with a Teflon type thread sealant or the threads can gall, making disassembly difficult to say the least. Here we’re chasing the twelve 36mm threaded spark plug wells in the cylinder heads with a tap and all 12 “bolts” with a 36mm Die. The last person to install the cam covers on this engine didn’t take the proper precautions (correct thread sealant) and getting it apart this time was an adventure, to say the least (we also had to file the other guy’s pipe wrench marks off of the bolt heads). Chasing the threads was an absolute necessity. We had this tap and die set specially made for us just for these engines since we run into this problem quite often.